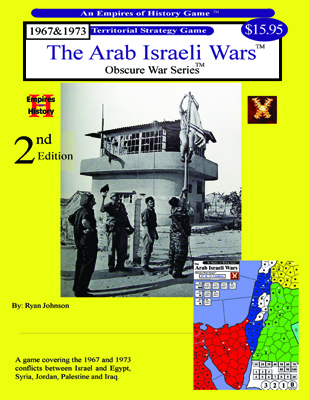 The Arab Israeli Wars is a territorial strategy board game covering the 1967 and 1973 wars between Israel and its Arab neighbors. It is an Empires of History game, which utilizes a D10 variant of the Axis & Allies gaming system. The Arab Israeli Wars includes 2 game scenarios; one for the 1967 War and one for the 1973 War. In the 1967 War Israel must strike out quickly to wrestle the Sinai region away from Egypt and deal deadly blows against Syria and Jordan before the weight of the superior Arab numbers can fully be mobolized, and before Iraq joins in the war against them. Israels ready reserves gives them an edge in calling up their armies and they have to leverage that for everything it is worth. In the 1973 war Israel begins play in control of the Sinia, Palestine, and the Golan Heights. The Arab powers must hit Isreal hard and fast, trying to overrun Israel's border armies before Isreal can mobolize its then-superior military might. 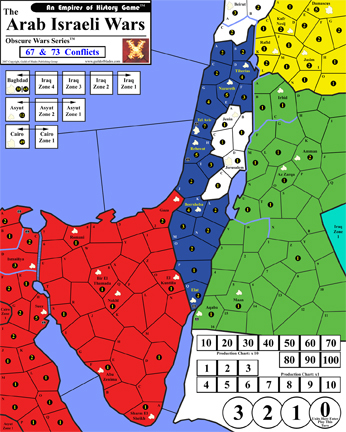 The Arab Israeli Wars is a fast paced game (some games can be concluded in as little as a hour) historically portraying these two middle east conflicts. Optional rules for land mines and the use of the nuclear weapons adds additional game play variety. 1) 17" x 22" two piece color game map. 2) 240 Die-cut color chipboard game pieces. 3) 68 Cut-Out color chipboard game pieces.